On June 20, 2008 at approximately 0921 hours, the Spokane Fire Department dispatched 2 Aerial Ladders, 3 Engines, 1 Heavy Rescue and 2 Command vehicles to a reported apartment fire located at 1306 S. Westcliff Place. The arriving fire crews found light smoke showing from the eaves and ridge vents of a two story apartment building. The building occupants had been alerted to the fire by means of a smoke detector and had evacuated the building. Fire crews found a smoldering fire in the attic area above a second floor bathroom. The fire was quickly extinguished by Engine 4's crew and confined to the ceiling area above the bathroom. There were no injuries to civilians or firefighters at this incident. PROBABLE CAUSE: The cause appears to have been an overheated bathroom exhaust fan. NARRATIVE: June 20, 2008 the Spokane Fire responded to its second mattress fire of the night and within a mile of the first one. The second fire at 4003 E. Cleveland came in at 1:19 am and is under investigation. Two civilians sustained minor injuries, one has burns on the wrist and the second was smoke inhalation. Neither of the patients wanted to be transported and was looked at by Fire Department Paramedics on the scene. When the homeowner was asked if smoke detectors woke them up he claimed they did not have any and the smoke woke him up. This is a dangerous mindset that smoke will wake you up as it is more likely to suffocate you in your sleep. You can not beat the reliability of working smoke detectors properly placed inside your house for early warning of fire. The Fire Department responded 7 pieces of equipment with 19 Firefighters to this incident and quickly brought the fire under control with one attack line. The house was searched to make sure everyone was out and ventilation fans were set to clear the smoke out of the house. DAMAGE EXTENT: Contents of 1 bedroom with smoke damage throughout the second floor of the house. NARRATIVE: Just after 10 pm on June 19, 2008 the Spokane Fire Department was dispatched on a reported house fire at 3411 E. Jackson in Spokane, WA. One Ladder Truck, one Rescue Unit, four Engines and a Battalion Chief with 19 Firefighters responded to what turned out to be a mattress fire with heat and smoke damage to the contents of one bedroom. Adults on scene indicated that one or more of the 3 children at the home were playing with matches. The children's ages were 13, 5 and 2. Information was gathered regarding the 3 children and will be turned over to a Fire Investigator and the departments Pub. Ed. Officer. Quick action by the resident with initial attack and then closing the door minimized the spread of the fire. Upon arrival Fire Crews rapidly removed the mattresses and extinguished the fire. It was noticed in the home that the smoke detector sustained significant damage due to heat and did not have a battery so was not sounding. The Spokane Fire Department would like to remind the public of the importance of keeping lighters, matches and other ignition sources out of reach of children. Also, the importance of maintaining smoke detectors in a working manner for the safety of everyone in the home cannot be over stated. PROBABLE CAUSE: Under investigation but appears to be juveniles playing with matches. DAMAGE EXTENT: Mattress fire with heat and smoke damage to the contents of one bedroom and minor smoke damage outside of the bedroom. NARRATIVE: On June 17, 2008 at 0351 hours the Spokane Fire Department dispatched 6 fire apparatus and 2 command vehicles (total of 24 personnel), for a reported structure fire located at 218 W. 25th Ave. Fire Dispatch received several 911 calls from the home owners and neighbors who reported a large amount of fire in the home's garage. Engine 9 arrived within 4 minutes of being dispatched and reported that fire had fully involved the home's garage and the 2 vehicles parked inside. Engine 9 extended pre-connected hose lines to fight the fire and assigned work to the other incoming apparatus. Additional fire hose lines were deployed to protect the surrounding exposures. The fire was brought under control within 15 minutes, but several units worked at the scene for well over an hour. There were no injuries to civilians at this fire. One firefighter reported a strained shoulder as a result of fighting the fire. The quick actions of the firefighters confined the majority of the fire damage to the garage and contents which were a total loss. The radiant heat from the fire cracked windows on the home and melted exterior yard lights. PROBABLE CAUSE: The fire cause at this time is still under investigation. Early indicators are leading us to believe this fire was intentionally set. DAMAGE EXTENT: Garage and Contents are a total loss. NARRATIVE: At 1:31 AM on June 16th the Spokane Fire department responded to 1417 South Laura for a reported structure fire. Engine Company 14 reported a light smoke showing. An attack lead was advanced into a bedroom and extinguished the fire. The fire was confined to a bed and bedding, night stand, and light smoke throughout... A smoke alarm awaken the mother and her young child, they got out of the house and called 911. The Spokane Fire Department would like to remind the public that unattended candles can and will start a fires. Candles should be in proper container and away any combustibles when being used. 3 Engines 1 Ladder, 1 Pumper Ladder, 1 Rescue apparatus and 2 command officers for a total of 21firefighters that responded to this call. The cause of this fire was an unattended candle. DAMAGE EXTENT: Bed, Bedding nightstand and smoke throughout. 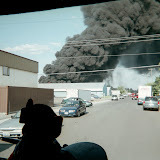 NARRATIVE: On 6/15/08 at 7:47 A.M. on June 15th, 2008 the Spokane Fire Department responded to a reported garage and recreational vehicle fire located at 2414 W. Mallon. The first fire crews to arrive reported a large amount of fire enveloping a recreational vehicle parked next to a wooden 3 stall garage. The fire was spreading to the garage and it was discovered that gasoline was burning near the vehicle. A decision to "upgrade" the alarm was then made to summon an additional crew to the incident. Firefighters rapidly stretched hoses to the fire and were able to contain the flames in a short amount of time. The vehicle was a total loss and a van that was parked nearby also sustained fire damage. As a result of the rapid spread rate of this fire, the wood frame garage sustained heavy fire damage as well. A total of 23 firefighters and 2 battalion chiefs responded to this call with 4 engine companies, 2 ladder companies, and 1 rescue company. Fire crews remained at the fire for 2 1/2 hours making sure that all of the "hotspots" were thoroughly extinguished. There were no injuries to firefighters or civilians. The fire cause is undetermined and under investigation at this time by the Spokane Fire Department Special Investigation Unit. PROBABLE CAUSE: Under investigation at this time by the Spokane Fire Department Special Investigation Unit. DAMAGE EXTENT: The R.V. was a total loss. One company van that was parked behind the R.V. sustained heavy fire damage. The 3 stall wooden garage received heavy damage. There was also some water damage to the interior of an adjacent storage building.